@JavRod - without looking at the detail behind each zone I’m taking a shot in the dark. Based on the description of “Front Yard Trees” if that zone is set for trees it will have a very deep root zone depth. 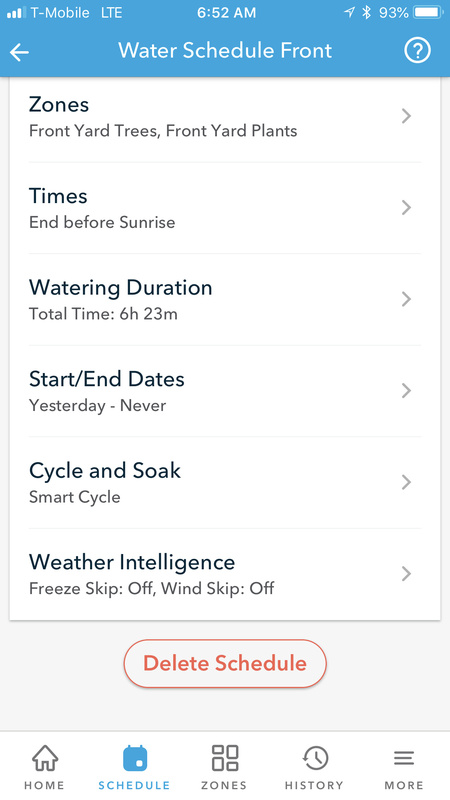 Rachio always starts off assuming there is no moisture in the root zone and will water if fully. For a deep root zone depth that is very long - but it won’t water again for a long time. If there are trees and grass or shrubs on the same zone, one needs to water for the most water needy plant (e.g. grass). The recommended path, unless one is an irrigation guru already, is to set all but one zone to a flex monthly type schedule. That will give very predicable results, with water saving and schedule changes based on climate averages. One can also set all the weather intelligence on too. For the zone not on flex monthly, pick a simple zone, and get the flex daily scheduled dialed in. All the variables are very important, soil type, precipitation rate, root depth, etc. One can start with the manufacture’s specifications, if known, for the precipitation rate from the sprinklers, but a catch cup test would be accurate and document efficiency. Once this zone is dialed in with flex daily, move on to the other zones using the settings as appropriate. Thank you for the reply. Let me fill in some details. We live in AZ, where its about 110 about now (will get hotter). We have kind of a hard clay dirt, and I only have (at the time connected too Rachio) Trees, and shrubs out front, each has its own zone (trees one and plants another). We had an automated RainBird which no one in the neighborhood knew how to program or what the hell it was doing, but it seemed to work automagically :-). When I set this up using the smart settings, it said 6 hours of watering, and I thought, that can not be, but yeah thats what it did. I have 1 Gallon drip emitters (x1) on the shrubs and adjustable (x2) for each tree (set to about 1-2 Gallons). Under advanced settings do I need to adjust the root settings (@25"), and the available water (now at .15)? There are several Arizona folks here on the forum that are more than willing to help people out. I think I did it all correctly and got most of the settings. Now the time went to 11 hours. I am going to have to call support. 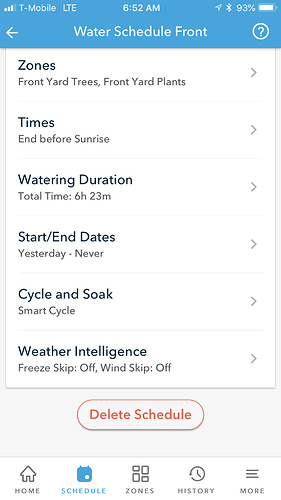 Post your zone settings in Rachio (both basic and advanced). Also give us a rundown of what your system is like (number and type of emitters on each plant).